A few generations ago families frequently lived under one roof. There was always someone available to care for those who needed it, whether it was immediate family or extended family. Today American families are smaller, more spread out, and often tied to jobs. As grandparents and parents age, or in the event of an unexpected illness, Americans are finding themselves in the role of caregiver, and few people are prepared to do this. It’s a 24 hour job when there is a sick, terminally ill person at home. I call these people ‘default caregivers,’ and I was one of them. My mother and I never talked about what would happen when she got old because she was still young. She was two years retired when we learned she had only a few months to live. As her only living relative for 500 miles, the responsibility of her care fell to me and became more intense as her disease progressed. I was clueless and completely unprepared for the job of taking care of a terminally ill person. The logistics of care and getting the right equipment, the right medications, the doctor’s appointments, the treatments, sitting up with her at night, feeding her, everything I had to do was stressful, and I felt helpless, confused, and unsure of what I was doing. She died in the intensive care unit of the hospital. It was not a good death for my mother and I was exhausted. Over time I learned about in-home medical care that I could have had for my mom during those last months. It’s called hospice. Medicare would have paid for the hospital bed and all the other equipment I had to rent for her, her medications and visits from nurses, nurse practitioners, aides and social workers. They would have helped my mom live better at the end. Her pain could have been managed and she could have spent some time enjoying the things she liked to do. If her oncologist or our family physician or anyone I trusted would have told me about hospice, my mother’s death could have been a good one. I work for a hospice now. Not in any medical capacity, I’m still clueless when it comes to medical care, but in the office where I can do some good. 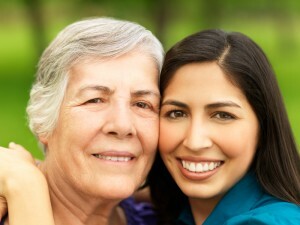 Caregivers, all caregivers, whether by default or by design, need support and reassurance. Studies prove that chronic stress puts people at risk for illness, and caregivers are definitely under chronic stress. That’s why caregivers need help, and hospice might be the right kind of help. I read letters and cards from the families of hospice patients. They all say ‘thank you’ in one way or another and refer to the nurses, aides, and social workers as angels. Most people tell us that they could never have gotten through such a difficult time without the help of hospice and the biggest lament that we hear is that they wish they had called hospice sooner. The mission of hospice is to provide the highest quality of medical care for those who need it, plus emotional support and caregiver training for the families and loved ones. In difficult situations it’s important to surround yourself with people you trust who know the things you don’t. Beginning March 10, Hospice Services of Lake County is offering a support group for caregivers that will be held in Lakeport. This support group is free to the public because Hospice Services of Lake County believes in caring for the people in our community. If you are interested, call 707-263-6222 and ask for Michy for dates and times. If you want to know how hospice can help you care for someone you love, call the same number and say you want to find out more about hospice services. Hospice can take a lot of weight off a person’s shoulders and the value of that is priceless.